There are a number of beautiful wedding dress styles and silhouettes for brides. Each silhouette creates an outline and graceful design. Find the perfect silhouette that flatters your frame and body type. The A-Line Silhouette is fitted at the bodice and flows out to the ground with an unbroken line, resembling the outline of an ‘A’. Due to its classic and simple style, the A-line gown is appropriate for any occasion, from a quiet backyard gathering to a traditional church ceremony. A great shape for all figures, in particular, those with a larger bust. The full skirt of the A-line can also hide a larger lower body, or create the illusion of curves on a narrow frame. However, the skirt of a modified A-line gown fits closer to the body than a traditional A-line gown. The ballgown, also known as the “Princess Fairy Tale” dress, can be a very figure-flattering choice. Some of it’s best features includes defining a wider waistline with a fitted bodice and concealing a heavier bottom with a flared waist and a full skirt. The skirt can be overwhelming on Petites further shortening their appearance, however, the ballgown is ideal for most body types due to its forgiving silhouette. The fit and flare skirt is also referred to as the trumpet silhouette. This style combines the sleek glamour of a mermaid gown with elements of a classic A-line gown. It accentuates and flatters because of its gently flared skirt and leaner profile. Whether you’re curvy, straight or somewhere in between, a fluted skirt has a magical way of balancing a woman’s shape. making it one of the best dress styles for hourglass figures. Sheath gowns have a slim shape that follows close to the line of the body. 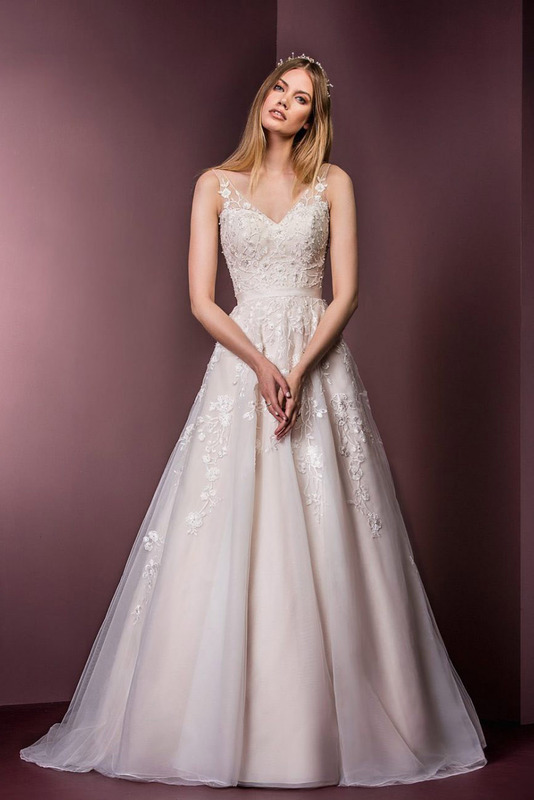 The straight design doesn’t allow for many body flaws, however, long lines of a sheath gown can elongate your body and make you appear taller. Therefore, this type of gown can work well for petite brides. Short wedding dresses are great for brides who are looking for something fun and non-traditional. The style of short dresses tends to be a good fit for outdoor, beach, and more casual weddings for brides who want to wear white, bridal gown with a skirt that falls above the knee. Short wedding dresses can occasionally be re-worn to future events, making these a popular choice for some brides. A "tea length" dress (so named because it's what a woman would wear to the tea table in the 1920s, according to Emily Post) falls about three to four inches below the knee and has lately become a great alternative to the floor-sweeping gown. With all these lovely silhouettes, make an appointment for a personal fitting and see how beautiful you look in different designs! See our other blog posts about wedding gowns!